Image caption Douglas Plumpton was a left-wing activist known to friends as "Rasta Jack"
A man who killed his friend with a sword he kept to inspire a Game of Thrones-style novel he was writing has been found guilty of murder. Douglas Plumpton, 26, admitted the manslaughter of Iain Maddocks, claiming that he never meant to harm him. But a jury convicted him of murder after hearing that the victim suffered several stab wounds in the March 30 attack at Plumpton's Birkenhead flat. 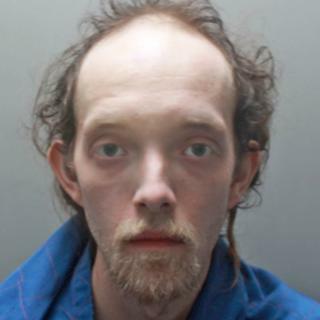 Plumpton will return to Liverpool Crown Court for sentencing in November. After the case, Det Insp Paul Parry said it was "particularly tragic" because the pair were friends, adding: "This incident stemmed from a row over drug money." Mr Maddocks, who lived in the same block in Whetstone Lane, had previously borrowed £180 from Plumpton, agreeing to pay it back at £70 a month, the court heard. However, by the time of the incident, he had only returned £40. Plumpton, a left-wing activist known to friends as "Rasta Jack", damaged Mr Maddocks' car headlights in anger, the court heard. The defendant claimed Mr Maddocks had then come to his flat with a kitchen knife - a version disputed by the prosecution - and so grabbed the large ceremonial sword, one of two he claimed he kept to help him create realistic scenes for his novel. Plumpton claimed his friend was fatally injured during a struggle with the sword. A pathologist found the victim suffered a total five stab wounds and two groups of slash-type wounds with blood along 19cm (7.5in) of the two-inch thick sword from the tip. A cut to his femoral artery proved fatal and Mr Maddocks died in hospital about 90 minutes later. Judge Alan Conrad QC adjourned the case for six weeks to allow a psychiatric report to be prepared.